Pasqua In Sampler [C6900] - $12.22 : Yarn Tree, Your wholesale source for cross stitch supplies. 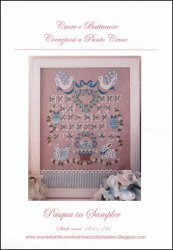 An Easter themed cross stitch sampler pattern from Cuore e Batticuore with a hen, a rabbit, decorated eggs, alphabet letters, and white doves. Little blue and white flowers accent the design. Stitched on #4178 Belfast Linen country mocha. Stitch count 161 x 191.